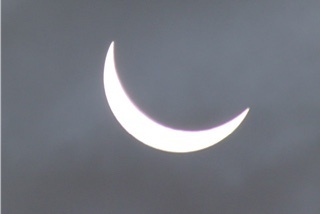 Today the UK witnessed an eclipse of the sun ....I love its smile. This is the last phase, 85% covered by the moon. Such a positive and uplifting event. I hope it signifies change for the better. We must remember that a miracle of nature is taking place within us at this very moment. I just think this is such an empowering post from Baylissa this morning that I want to make sure everyone has had a chance to read it. Guys, what’s going on? Why spend your entire withdrawal comparing notes and working yourselves up into a frenzy? I know it’s not easy to spend day after day, month after month, year after year for some of you, trying to cope with the complexities and demands of withdrawal, but please... step back and put things into perspective. This is something 10s of 1,000s of people have experienced over the past 50+ years, long before it was even recognised for what it is… from the first person tried to come off Librium, post 1960. If recovery was not the normal outcome, this page would have around 30,000 or more members freaking out about having had symptoms for the past 20, 30, 40 years! I am not judging anyone. Maybe if Facebook was around when I was in withdrawal, I would have been seduced by it too. Every day I am thankful that I was stuck in my little cottage with Eckhart Tolle et al, “Friends” and "Shawshank Redemption" and my little Paramahansa Yogananda healing book (thanks to my AT for reminding me). Why? Because everything is energy and I do believe if I was fixated on my computer, I would have been absorbing way too much of the fears and anxieties of other people. Technology is taking away our ability to be grounded. Consistent computer screens and electric and magnetic fields are not good for the nervous system. Add to that the frightening and frantic exchanges from the people who are losing hope and you have a recipe for prolonged feelings of ill health, dis-ease and despair. Please consider these things. One of the reasons I come here to post is just to reassure you that we heal. But this doesn't always have to come from me. The reality is that we humans are self-healing. When I was mostly recovered from withdrawal I did a degree in metaphysics from the University of Sedona. It wasn’t accredited or anything and I don't normally mention it, but it remains, by far, the best education I have ever received. I learned so much about the self-healing capabilities and intelligence of the human body, the power of the mind, and the relevance of meditation and mindfulness, I do feel it has set me up for life. There is a lot about withdrawal that I do not know. My knowledge of some aspects is limited and I am not interested in all the different theories about what causes what, etc. Based on the studies I've done and what I have observed, I conclude that withdrawal is so bizarre, it defies the laws of logic, it has no rhyme, no reason, and there is no empirical evidence to prove anything. So speculating and freaking out makes no sense. The only thing I know is that we heal, that self-compassion is powerful, that gratitude is a mood-enhancer, and that acceptance and mindfulness can eliminate a lot of worry, anxiety and depression. I do not want to dis-empower you by having you think I have all the answers. I don't. When I speak of feeling invincible after withdrawal it is because I had to find ways to spur myself on and to speak positively to myself and to stay alive. Don't underestimate your ability to cope. Don't underestimate your strength. Everything you need is within you. But you must take a break from the computer and other people's energy and be still for a while, in nature or somewhere else that is grounding. When you use that power within you to cope and the storm ends, you think, I did that? Wow! I am amazing! You feel so proud of yourself, in the humblest of ways, and you emerge with a confidence in your ability to handle whatever life sends your way. So, come on! Stop spending so much time playing, “Let’s catastrophize!” Let it go. Accept what is happening and allow your body to heal. Withdrawal does not last forever. You will recover and be able to pick up the pieces and continue along your different paths. It's just a matter of time. Phew... okay, I just had to get this out of my system. I’ll probably delete this later. Writing is my therapy. Well,it’s just that I feel that all the positive things I share here get eroded along the way by the collective energy of despair that pervades the virtual recovery community. The reality is that withdrawal ends with recovery. We heal, we pick ourselves up, and we move on. This is your truth. Believe it. I know I’m guilty of fixating on my withdrawal and searching for answers on the Internet and from my Internet friends. I’ve often panicked over advice I’ve received or something someone has said that’s plunged me into a downward spiral. I’ve read the forums and believed I was going to suffer for years with intense symptoms. I have had every illness under the sun and would certainly never recover and be healthy and well again. Absolutely wrong, I must remember my own words, ‘Everyone recovers’. Just last night I removed my ipad and iphone from my bedroom. The waves from Wifi could interfere with brain patterns and prevent sleep. I slept well! It may be coincidence but then this post from Baylissa appeared today. I’m sure if we stop focusing on symptoms and stop interacting on the Net in a negative way then the recovering brain will start functioning more normally. I love to hear from others and help with their withdrawal but I also know that only positivity is going to bring them relief in the long run. However far along the recovery road, remember the end is drawing closer day by day for everyone. I’m waving in and out on a daily basis. Today I feel clear-headed and very well with no symptoms. Yesterday I was bed ridden with intense anxiety and pain throughout my legs, arms and back. This syndrome can change at the drop of a hat and accepting and surrendering to all that happens is the only way through. This is the healing process.